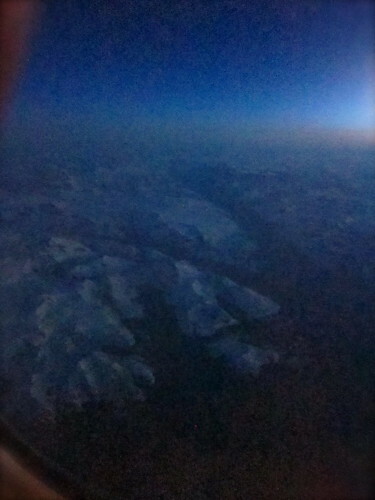 I awoke just in time to see Greenland outside my window. We were on a flight to Reykjavik, and the Mercator maps hadn’t prepared me for how close to the arctic circle we’d be traveling. From Boston to Iceland, I’d assumed our path would be completely over water, and listened for the instructions on evacuating at sea. Most of it was in Icelandic, of course. 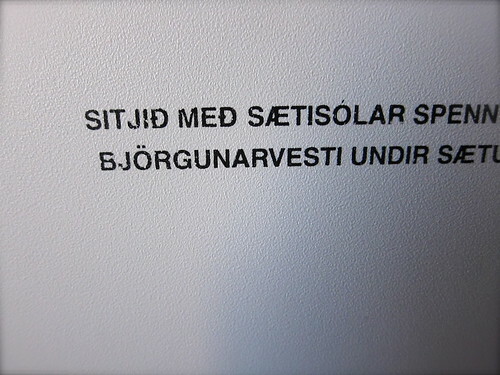 The only word I learned before leaving was takk, or “thanks.” Spending a mostly sleepless flight staring at the back of the seat in front of me did nothing to increase my vocabulary. We’d left Boston at 9:30 the night before, to arrive five hours later at 6:30 in the morning. 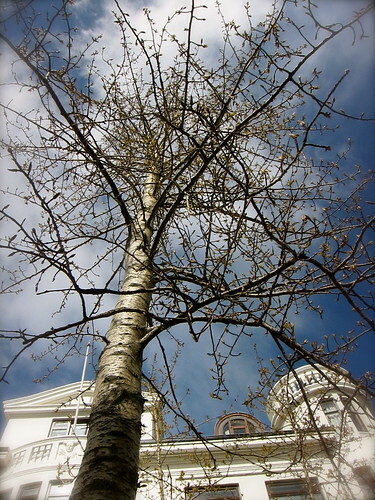 This would be my first trip to Iceland, the Gardener’s third, and I was thrilled at the chance to visit. I felt like Dorothy arriving in Oz, except in reverse. At home, things were greening. 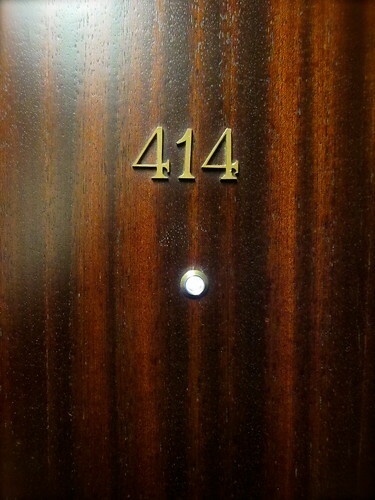 Here, barely so. From the Keflavik airport, a shuttle bus brought us into town, where a modern day Viking oversees the station. 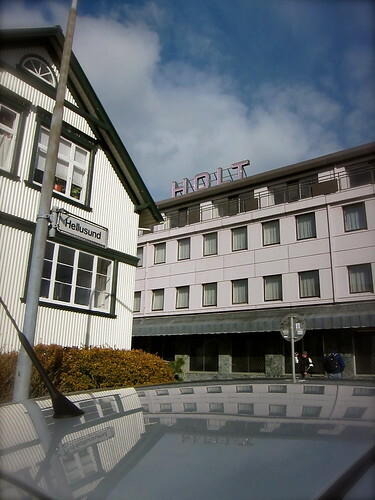 The Hotel Holt is within walking distance and on a quiet residential street. Behind the International-style cinder block facade, we discover a trove of mid-century modern. 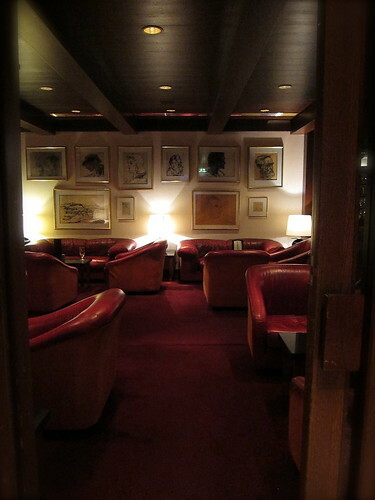 The hotel dates back to 1965 much of its retro glamour remains, despite several renovations. 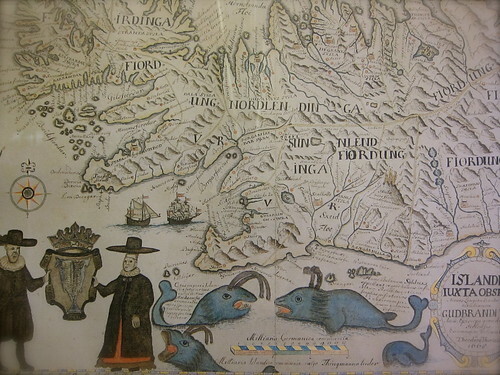 On display throughout the hotel is the Holt’s notable Icelandic art collection. 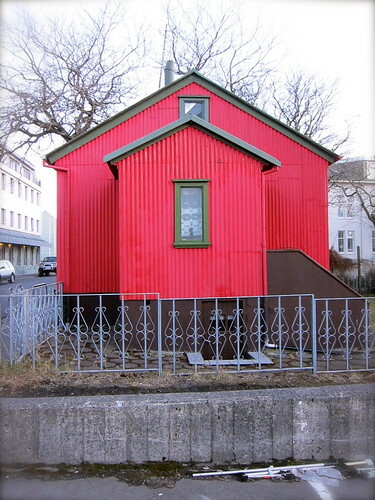 Including prints, drawings, paintings and sculpture, it’s the largest privately owned collection in Iceland. After checking in, we breakfasted on skyr, the Icelandic yogurt, marinated herring and rúgbrauð, a dark rye bread, then set off to explore the neighborhood. 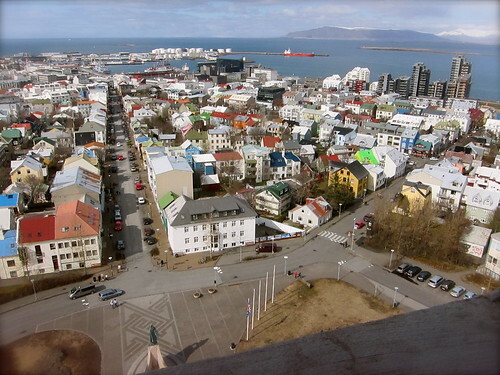 Our first destination was the Lutheran church, Hallgrímskirkja, prominently situated on the highest point in Reykyavik. 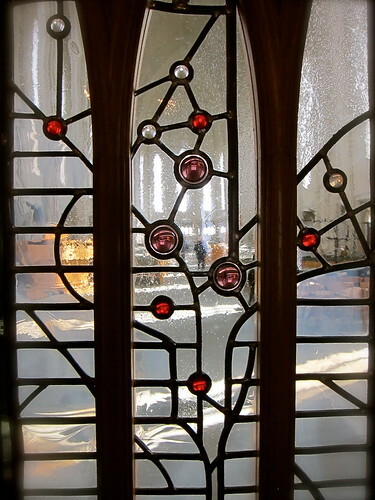 Except for the stained glass doors to the nave, there’s little embellishment. 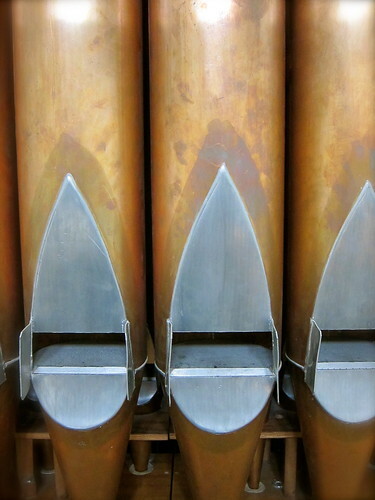 The light-filled interior is as austere as the exterior, and a sizable organ dominates the space. What we really came for was the view from the steeple. 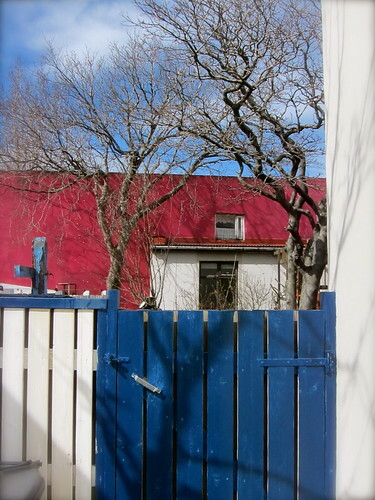 Unusual for Reykjavik, the day was sunny and clear, though extremely windy, a more common occurrence. We lingered as long as we could, taking in the city, surrounding sea, and snow-capped peaks, then retreated back down into the street. 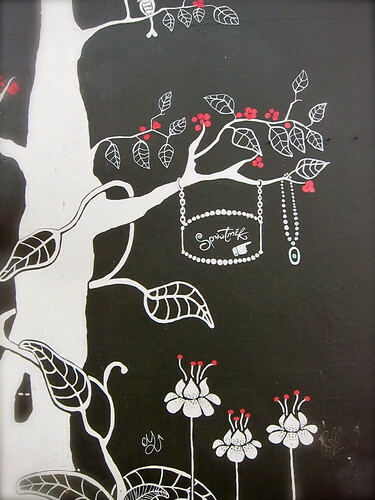 By mid-afternoon we were ready for a snack, and ducked into the cafe Mokka Kaffi. 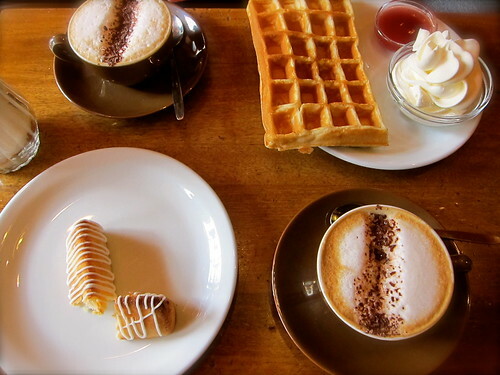 We took a look around and ordered what everyone else seemed to be having: waffles and, instead of hot chocolate, a cup of cappuccino. We watched how the locals do it — tear off a piece of warm waffle, and slather it with a dab of jam and a dollop of whipped cream. I was already smitten with Iceland and that first bite sealed the deal. Before heading back to the hotel, we stopped off at a grocery store to pick up some skyr. 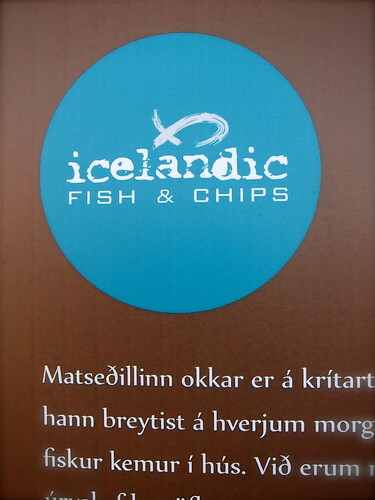 English is widely spoken, however, most of the food packaging was in Icelandic only. 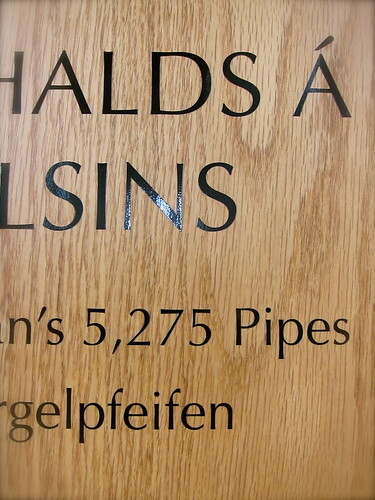 Without a translation, what was unidentifiable was made even more so. 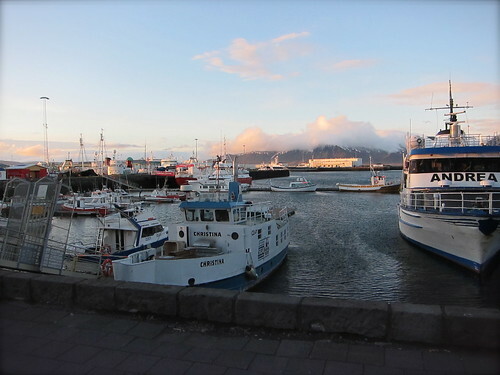 After a much needed nap, we headed to Icelandic Fish & Chips down by the harbor for an easy, casual dinner. After our experience in the grocery store, it was a relief to find the menu in English. 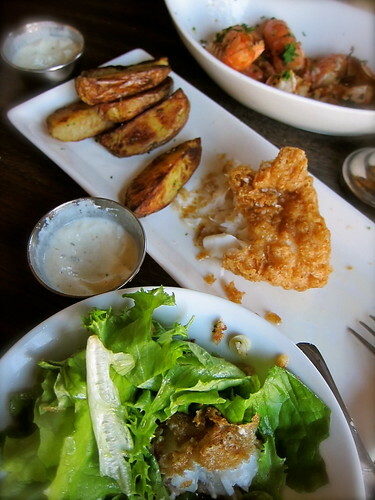 The specialty of this organic bistro is a rotating list of freshly caught fish, fried in a crunchy spelt batter. 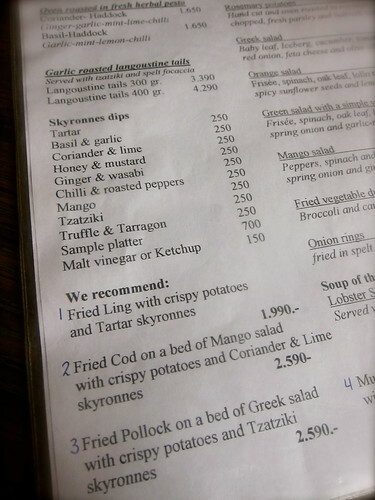 Today’s choices were ling, cod or pollock; prices shown are in krónur, the Icelandic currency. We ordered a couple of glasses of Egils Gull lager, and had the fried ling and crispy, oven roasted potatoes served with skyr tartar sauce, and an order of garlic roasted langoustine tails. After the long travel day, the salad was particularly welcome nourishment. We finished dinner around 9:30, with plenty of daylight left to stroll around the harbor and take in the northern evening. 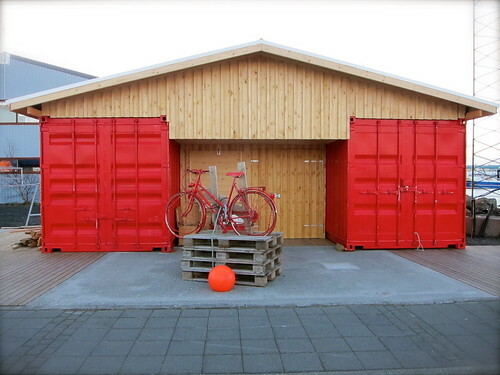 We came across this building made of two shipping containers, painted a bright red and housing a bike rental agency. As a bookend to our walk — this little red house across from our hotel, a figurine of Charlie Chaplin sits in the window. From the balcony of our hotel at 10:30 pm, shortly after sunset. It was as if night never came, the light just gradually deepened to a dark ultramarine, then returned around 4 am. We made sure to close the dark-out drapes the next night. 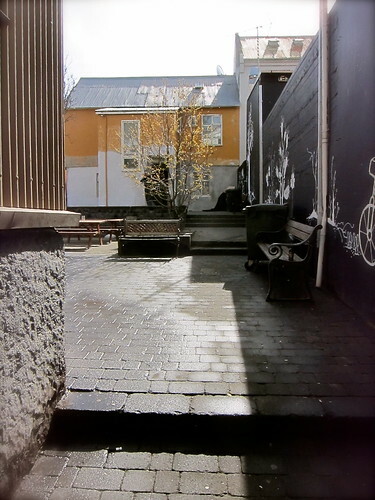 This entry was posted in field trip and tagged iceland, reykjavik. Bookmark the permalink. Don’t envy you the long, boring cattle car ride in the plane, but it sure looks like it was worth it once you got off. Great day to start you off. Have a wonderful trip. 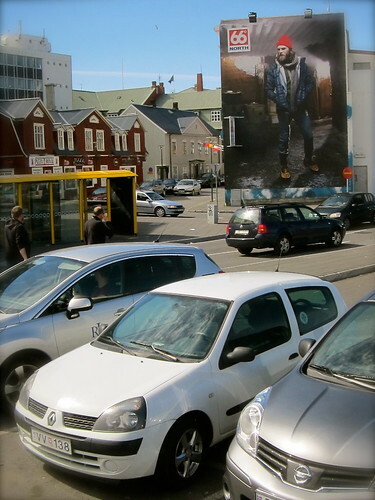 Thanks for all these photos, they brought back memories of living in Iceland for nearly four years back in the late 90s. We loved that country, although I missed the warm weather. Gorgeous pictures of a gorgeous place. Enjoy the trip! fascinating. Thanks for sharing the photos. Great mix of architecture, art, and food. Loved it. Glad you enjoyed the pix, it was a much-needed vacation break! Oh wow, what a wonderful post. 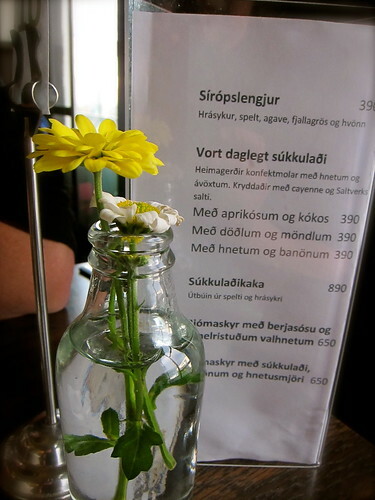 Can’t wait for going back to Iceland this summer and dive into the Icelandic food, people and landscape! Gee, thanks! Nothing compared to yours, though ;) Lucky you that you visit in summer, so much was still closed while we were there. I kept trying to imagine the landscape in its more verdant state… It’s a very special place, isn’t it? Fascinating. I’ve wanted to visit Iceland for a long time but the season is so short it has never co-incided with a convenient time. Your post wants me to go even more. I can’t recommend it enough, it was everything I imagined! The exchange rate makes it shockingly expensive for Americans, but well worth it. Lovely photo essay. I hope the weather stays nice. 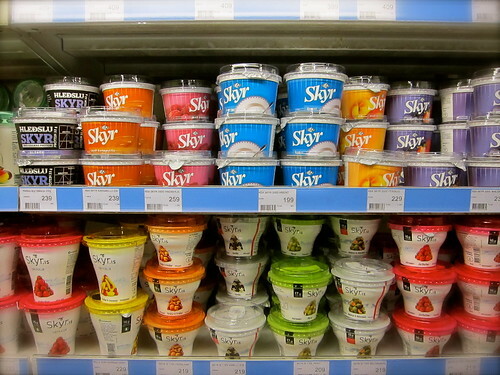 I would like to make skyr. I have not tried culturing milk with the skyr I buy here. 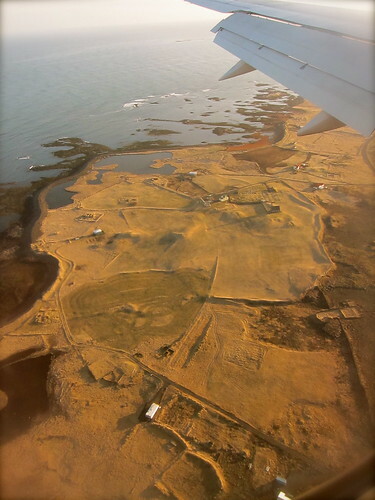 So happy for you to be experiencing and enjoying this (looks to be) epic journey to Iceland and also somewhat jealous! I’ve *always* wanted to go there. Love love love the photos – a feast! 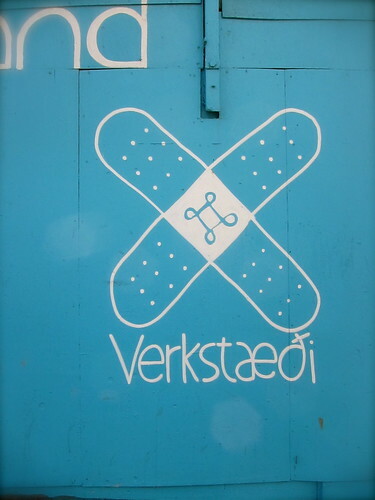 Are those (the tree and the band-aid etc) graffiti shots?? If so, very interesting. 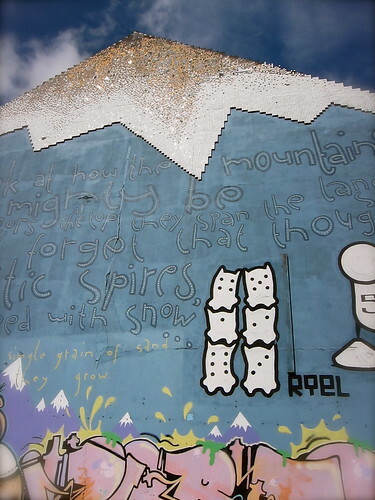 Iceland’s a visual feast and I couldn’t help but think of you when I saw these wall paintings… I took the photos of them especially for you!